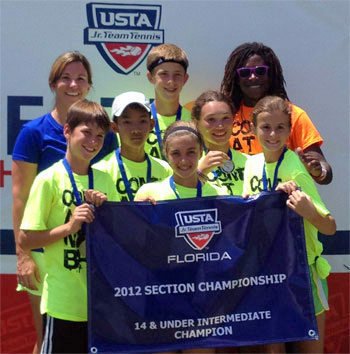 Teams from Gainesville, Indian Harbour Beach, Jacksonville, and Melbourne will represent the USTA Florida Section at Jr. Team Tennis Nationals after claiming the Florida state championships in the 14-under and 18-under divisions at the 2012 USTA Florida Jr. Team Tennis Summer Championships, held July 27-29 at the Florida Tennis Center in Daytona Beach. The 2012 USTA Jr. Team Tennis National Championships will be held in Cayce, S.C., on Oct. 18-21, 2012, for the 14-under Intermediate and Advanced divisions, and on Oct. 25-28 for the 18-under Intermediate and Advanced divisions. USTA Jr. Team Tennis (JTT) brings kids together in teams to play singles, doubles and mixed doubles against other teams. It promotes social skills and important values by fostering cooperation and unity, as well as individual self-growth. It is designed for kids ages 5-18, and matches can be held anywhere from a local park or school to a commercial or private club. JTT teams are co-ed and divided by the play levels Beginner, Intermediate, Advanced, and the age groups 18-under, 14-under, 12-under, and utilizing the 10 and Under Tennis format for the 10-under and 8-under leagues. In the 14-Intermediate final the Westside Wailers captured the title, finishing ahead of their opponents from Miami. The Westside Wailers play out of Westside Park in Gainesville, and in the final in Daytona Beach defeated the Miami Contenders 148-118 in total games. They are captained by Jennine Brandt, with the team roster comprised of Benjamin Nagoshi, Madison Sagas, Darby Arden Townsend, Sophia Katharine Papa, Zachary Brandt, and Benjamin Brandt.